A ferocious kill on the Serengeti… dire warnings about endangered species… These clichés of nature documentaries ignore a key feature of the landscape: villagers just off-camera, who navigate the dangers and costs of living with wildlife on a daily basis. When seen at all, rural Africans are often depicted as the problem – they poach animals and encroach on habitat, they spoil our myth of wild Africa. 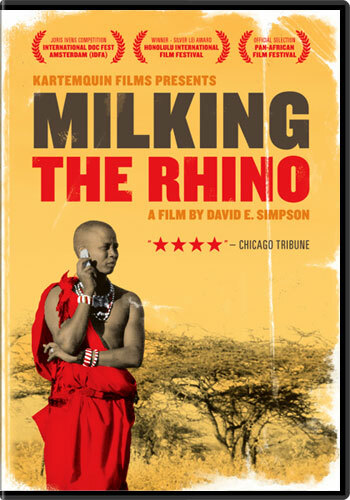 Milking the Rhino tells a more nuanced tale of human-wildlife coexistence in post-colonial Africa. The Maasai tribe of Kenya and Namibia's Himba – two of Earth's oldest cattle cultures – are in the midst of upheaval. Emerging from a century of "white man conservation," which turned their lands into game reserves and fueled resentment towards wildlife, Himba and Maasai communities are now vying for a piece of the wildlife-tourism pie. Community-based conservation, which tries to balance the needs of wildlife and people, has been touted by environmentalists as "win-win." The reality is more complex. "We never used to benefit from these animals," a Maasai host of a community eco-lodge explains. "Now we milk them like cattle!" His neighbor disagrees: "A rhino means nothing to me! I can't kill it for meat like a cow." And when drought decimates the grass shared by livestock and wildlife, the community's commitment to conservation is sorely tested. Charting the collision of ancient ways with Western expectations, Milking the Rhino tells intimate, hopeful and heartbreaking stories of people facing deep cultural change.